FEB 16th Wandering Lies w/ Accidents, Better Homes and Pressive at JAMMIN’ JAVA! FRIDAY FEB 16th Wandering Lies is making our dramatic return to one of our favorite places to rock out: Jammin’ Java! Joining us on the bill are our good friends Accidents and Better Homes PLUS the group PRESSIVE (from Guadajalara, Jalisco) is swinging through town to join us as well! Please hit up any band member for pre-sale tickets look us up at ticketfly.com! Doors open at 8pm and the music starts at 9! Alex’s Army Battle of the Bands 2018 SAT Jan 27th!! Battle of the Bands!!! It’s our 4th year supporting this great cause with music, raffles, drinks, food, friends, and friendly competition!!! Come out and help us fight against Childhood Cancer!! WE HIT THE STAGE AT 8:15 PM!!!!! WANDERING LIES at the MASON INN Friday Jan 26th 2018! For Clarendon Day we rock the crowds at SEPT 23rd 11AM sharp!! A full day of drinks, food, and music!! Family & pet friendly!! (there’s beer). 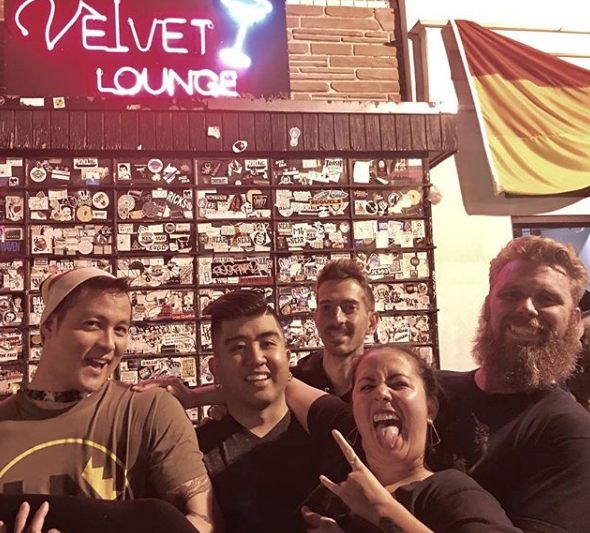 ROCK AT THE VELVET LOUNGE D.C.!! !